Instances exist in which autograft is not available because of multiple reconstructions or combined ligament injuries. In addition, after discussing the advantages and drawbacks of the various graft materials available, patients may choose not to use autograft material. In these situations, other graft sources must be considered. This article deals with the grafts available and is aimed at providing the reader with an increased confidence in choosing from various materials. It does not cover surgical indications or techniques, which are addressed in other articles in Medscape Drugs & Diseases. The anatomy of the knee is reflective of its function in ambulation. Knee stability and pain-free range of motion are important in maintaining daily function. Most commonly, overuse, age, and traumatic injuries cause structural damage to the knee that may limit its function. Therefore, a thorough understanding of the anatomy of the knee is essential to properly diagnosing and treating knee pathology. The ACL attaches posterior to the attachment of the medical meniscus on the anterior intercondylar area of the tibia and passes superior, posterior, and lateral, where it attaches to the posterior part of the medial side of the lateral condyle of the femur. The PCL arises from the posterior intercondylar area and passes on the medial side of the ACL to attach to the anterior part of the lateral surface of the medial condyle of the femur. The menisci are wedge-shaped and attach at their ends to the intercondylar area of the tibia. The medial meniscus is C-shaped and firmly adheres to the deep surface of the MCL medially, the ACL anteriorly, and the PCL posteriorly. Because of these attachments, the medial meniscus is less mobile than the lateral meniscus. 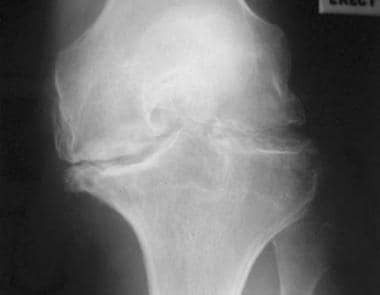 For more information about the relevant anatomy, see Knee Joint Anatomy. An image depicting ACL injury can be seen below. Anterior cruciate ligament reconstruction aims to reduce instability episodes in an attempt to preserve the meniscus. When meniscal injury has occurred, the knee becomes degenerate with time. Long-term published clinical studies comparing allografts with autografts are few. Indelicato et al  and Shelton et al  showed generally good results in comparison of the tissues. One study showed improved long-term outcomes with autograft over allograft as well as with not smoking and with normal body mass index. In another study, an overall trend of fewer patellofemoral symptoms and better range of motion with allografts was noted. Shelton described a trend of increased pivot glide with allograft, which was not statistically significant. Beynnon theorized that the initial and 2- to 3-year outcome studies may not accurately assess longer-term results. He showed that reestablishing anteroposterior (AP) stability does not predict future graft behavior. Using strain gauges in autograft reconstructions, he showed that strain characteristics established at the time of surgery were a more powerful predictor of long-term results. Grafts that varied most from normal strain patterns in the early postoperative period showed long-term failure. This is disturbing when bench studies have shown that tensioning allografts in the human cadaver knee to fully achieve AP joint stability increased forces in the graft at all angles of flexion. Authors have long proclaimed dangerous strain and shearing in terminal extension. Of particular note, the good results that Indelicato  and Shelton  achieved all predated the era of accelerated rehabilitation protocols popularized by Shelbourne. In fact, the allograft protocols included limited arcs and crutch weightbearing for up to 12 weeks. With all of this in mind and with the knowledge that allografts take longer to remodel and mature, the following question remains: Should there be concern with allografts in general, and specifically in relation to ongoing trends in accelerated rehabilitation? Although Shelbourne has not suggested this, should his autograft axiom be applied? It allows activity based on the status of rehabilitation and not on graft biology. In a meta-analysis and systematic review of prospective studies evaluating irradiated allograft against autograft for ACL reconstruction, Wang et al found that the former was inferior to the latter with respect to knee stability and subjective evaluation but that the two types of graft did not differ significantly with repsect to function and complications. However, only a limited number of randomized controlled trials were included in the analysis, and more such studies, with longer follow-up periods, would be required to define failure rates more accurately. Eriksson E. Auto- or allograft for ACL-reconstruction?. Knee Surg Sports Traumatol Arthrosc. 2007 Jun. 15(6):689. [Medline]. Vyas D, Rabuck SJ, Harner CD. Allograft anterior cruciate ligament reconstruction: indications, techniques, and outcomes. J Orthop Sports Phys Ther. 2012 Mar. 42(3):196-207. [Medline]. Jackson DW, Grood ES, Arnoczky SP, et al. Freeze dried anterior cruciate ligament allografts. Preliminary studies in a goat model. Am J Sports Med. 1987 Jul-Aug. 15(4):295-303. [Medline]. Indelicato PA, Bittar ES, Prevot TJ, Woods GA, Branch TP, Huegel M. Clinical comparison of freeze-dried and fresh frozen patellar tendon allografts for anterior cruciate ligament reconstruction of the knee. Am J Sports Med. 1990 Jul-Aug. 18(4):335-42. [Medline]. Shelton WR, Papendick L, Dukes AD. Autograft versus allograft anterior cruciate ligament reconstruction. Arthroscopy. 1997 Aug. 13(4):446-9. [Medline]. Spindler KP, Huston LJ, Wright RW, Kaeding CC, Marx RG, Amendola A, et al. The prognosis and predictors of sports function and activity at minimum 6 years after anterior cruciate ligament reconstruction: a population cohort study. Am J Sports Med. 2011 Feb. 39(2):348-59. [Medline]. van Arkel ER, de Boer HH. Survival analysis of human meniscal transplantations. J Bone Joint Surg Br. 2002 Mar. 84(2):227-31. [Medline]. Beynnon BD, Johnson RJ, Fleming BC, Stankewich CJ, Renström PA, Nichols CE. The strain behavior of the anterior cruciate ligament during squatting and active flexion-extension. A comparison of an open and a closed kinetic chain exercise. Am J Sports Med. 1997 Nov-Dec. 25(6):823-9. [Medline]. Shelbourne KD, Nitz P. Accelerated rehabilitation after anterior cruciate ligament reconstruction. Am J Sports Med. 1990 May-Jun. 18(3):292-9. [Medline]. Reinhardt KR, Hetsroni I, Marx RG. Graft selection for anterior cruciate ligament reconstruction: a level I systematic review comparing failure rates and functional outcomes. Orthop Clin North Am. 2010 Apr. 41(2):249-62. [Medline]. Mehta VM, Mandala C, Foster D, Petsche TS. Comparison of revision rates in bone-patella tendon-bone autograft and allograft anterior cruciate ligament reconstruction. Orthopedics. 2010 Jan. 33(1):12. [Medline]. Nagda SH, Altobelli GG, Bowdry KA, Brewster CE, Lombardo SJ. Cost analysis of outpatient anterior cruciate ligament reconstruction: autograft versus allograft. Clin Orthop Relat Res. 2010 May. 468(5):1418-22. [Medline]. [Full Text]. Guo L, Yang L, Duan XJ, He R, Chen GX, Wang FY. Anterior cruciate ligament reconstruction with bone-patellar tendon-bone graft: comparison of autograft, fresh-frozen allograft, and ?-irradiated allograft. Arthroscopy. 2012 Feb. 28(2):211-7. [Medline]. Lamblin CJ, Waterman BR, Lubowitz JH. Anterior cruciate ligament reconstruction with autografts compared with non-irradiated, non-chemically treated allografts. Arthroscopy. 2013 Jun. 29(6):1113-22. [Medline]. Barrett GR, Luber K, Replogle WH, Manley JL. Allograft anterior cruciate ligament reconstruction in the young, active patient: Tegner activity level and failure rate. Arthroscopy. 2010 Dec. 26(12):1593-601. [Medline]. Bottoni CR, Smith EL, Shaha J, Shaha SS, Raybin SG, Tokish JM, et al. Autograft Versus Allograft Anterior Cruciate Ligament Reconstruction: A Prospective, Randomized Clinical Study With a Minimum 10-Year Follow-up. Am J Sports Med. 2015 Oct. 43 (10):2501-9. [Medline]. Wang HD, Zhu YB, Wang TR, Zhang WF, Zhang YZ. Irradiated allograft versus autograft for anterior cruciate ligament reconstruction: A meta-analysis and systematic review of prospective studies. Int J Surg. 2018 Jan. 49:45-55. [Medline]. Edgar CM, Zimmer S, Kakar S, Jones H, Schepsis AA. Prospective comparison of auto and allograft hamstring tendon constructs for ACL reconstruction. Clin Orthop Relat Res. 2008 Sep. 466 (9):2238-46. [Medline]. Shino K, Inoue M, Horibe S, et al. Maturation of allograft tendons transplanted into the knee. An arthroscopic and histological study. J Bone Joint Surg Br. 1988 Aug. 70(4):556-60. [Medline]. Yoldas EA, Sekiya JK, Irrgang JJ, Fu FH, Harner CD. Arthroscopically assisted meniscal allograft transplantation with and without combined anterior cruciate ligament reconstruction. Knee Surg Sports Traumatol Arthrosc. 2003 May. 11(3):173-82. [Medline]. Lawhorn KW, Howell SM. Scientific justification and technique for anterior cruciate ligament reconstruction using autogenous and allogeneic soft-tissue grafts. Orthop Clin North Am. 2003 Jan. 34(1):19-30. [Medline]. Bolano L, Kopta JA. The immunology of bone and cartilage transplantation. Orthopedics. 1991 Sep. 14(9):987-96. [Medline]. Bullis DW, Paulos LE. Reconstruction of the posterior cruciate ligament with allograft. Clin Sports Med. 1994 Jul. 13(3):581-97. [Medline]. Jackson DW, Simon TM, Kurzweil PR, Rosen MA. Survival of cells after intra-articular transplantation of fresh allografts of the patellar and anterior cruciate ligaments. DNA-probe analysis in a goat model. J Bone Joint Surg Am. 1992 Jan. 74(1):112-8. [Medline]. [Guideline] Management of anterior cruciate ligament injuries. American Association of Orthopaedic Surgeons. Available at https://www.aaos.org/research/guidelines/ACLGuidelineFINAL.pdf. September 5, 2014; Accessed: February 2, 2018. Kraeutler MJ, Kim SH, Brown CC, Houck DA, Domby BC, Reynolds KA, et al. Clinical Outcomes Following Primary Anterior Cruciate Ligament Reconstruction with Hamstring Autograft versus Planned Hybrid Graft. J Knee Surg. 2018 Jan 2. [Medline]. Standards for Tissue Banking. 14th ed. McLean, VA: American Association of Tissue Banks; 2017. Asselmeier MA, Caspari RB, Bottenfield S. A review of allograft processing and sterilization techniques and their role in transmission of the human immunodeficiency virus. Am J Sports Med. 1993 Mar-Apr. 21 (2):170-5. [Medline]. Simonds RJ, Holmberg SD, Hurwitz RL, et al. Transmission of human immunodeficiency virus type 1 from a seronegative organ and tissue donor. N Engl J Med. 1992 Mar 12. 326(11):726-32. [Medline]. Jackson DW, Windler GE, Simon TM, et al. Intraarticular reaction associated with the use of freeze-dried, ethylene oxide-sterilized bone-patella tendon-bone allografts in the reconstruction of the anterior cruciate ligament. Am J Sports Med. 1990 Jan-Feb. 18(1):1-10; discussion 10-1. [Medline]. Langer F, Czitrom A, Pritzker KP, Gross AE. The immunogenicity of fresh and frozen allogeneic bone. J Bone Joint Surg Am. 1975 Mar. 57(2):216-20. [Medline]. Rihn JA, Irrgang JJ, Chhabra A, Fu FH, Harner CD. Does irradiation affect the clinical outcome of patellar tendon allograft ACL reconstruction?. Knee Surg Sports Traumatol Arthrosc. 2006 Sep. 14(9):885-96. [Medline]. Buck BE, Malinin TI, Brown MD. Bone transplantation and human immunodeficiency virus. An estimate of risk of acquired immunodeficiency syndrome (AIDS). Clin Orthop. 1989 Mar. (240):129-36. [Medline]. Roberson TA, Abildgaard JT, Wyland DJ, Siffri PC, Geary SP, Hawkins RJ, et al. "Proprietary Processed" Allografts: Clinical Outcomes and Biomechanical Properties in Anterior Cruciate Ligament Reconstruction. Am J Sports Med. 2017 Nov. 45 (13):3158-3167. [Medline]. Ozer H, Selek HY, Turanli S, Atik SO. Failure of primary ACL surgery using anterior tibialis allograft via transtibial technique. Arthroscopy. 2007 Sep. 23(9):1026. [Medline]. Richmond JC, Weitzel PP. Bioresorbable scaffolds for anterior cruciate ligament reconstruction: do we need an off-the-shelf ACL substitute?. Sports Med Arthrosc. 2010 Mar. 18(1):40-2. [Medline]. Borchers JR, Pedroza A, Kaeding C. Activity level and graft type as risk factors for anterior cruciate ligament graft failure: a case-control study. Am J Sports Med. 2009 Dec. 37(12):2362-7. [Medline]. Arnoczky SP, Warren RF, Ashlock MA. Replacement of the anterior cruciate ligament using a patellar tendon allograft. An experimental study. J Bone Joint Surg Am. 1986 Mar. 68(3):376-85. [Medline]. Drez DJ Jr, DeLee J, Holden JP, et al. Anterior cruciate ligament reconstruction using bone-patellar tendon- bone allografts. A biological and biomechanical evaluation in goats. Am J Sports Med. 1991 May-Jun. 19(3):256-63. [Medline]. Barker JU, Drakos MC, Maak TG, Warren RF, Williams RJ 3rd, Allen AA. Effect of graft selection on the incidence of postoperative infection in anterior cruciate ligament reconstruction. Am J Sports Med. 2010 Feb. 38(2):281-6. [Medline]. Centers for Disease Control and Prevention (CDC). Update: allograft-associated bacterial infections--United States, 2002. MMWR Morb Mortal Wkly Rep. 2002 Mar 15. 51(10):207-10. [Medline].